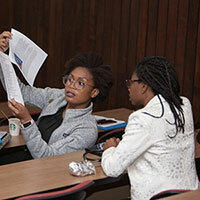 Leadership Education to Advance Diversity–African, Black and Caribbean (LEAD-ABC) is a new UCI School of Medicine program aimed at producing future physicians who are committed to serving African, black and Caribbean communities in California, the United States and beyond. LEAD-ABC, which will accept its first students in 2019, is the first medical school program of its kind in the nation to address the unique health needs of black, African and Caribbean islander communities. This four-year physician training program offers an optional fifth year to allow the medical student to obtain a master's degree in business, public health or biomedical and translational science. In its inaugural year, LEAD-ABC will offer two full scholarships to cover tuition and fees for the medical degree, as well as tuition and fees for a master's program at UCI. Vision: LEAD-ABC will develop the next generation of physician leaders who are committed to public service, social justice and advocacy within these communities. Mission: The mission of LEAD-ABC is to train and support students in medicine as they become medical professionals who will work to reduce healthcare disparities in these communities. 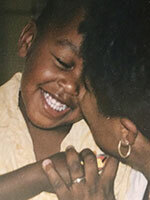 LEAD-ABC is the nation’s first medical education program designed specifically to address the unique healthcare needs of underserved communities of black, African and Caribbean heritage. LEAD-ABC students will engage in a program orientation one to two weeks before the traditional medical school curriculum. The purpose of this pre-matriculation orientation is to introduce students to health conditions in underserved black, African and Caribbean communities. During this period, LEAD-ABC students will be made aware of the consequences surrounding lack of access to healthcare and the varying degrees of health disparity faced by this patient population. This exposure is intended to lay a foundation of understanding that will direct students on a path to becoming physician leaders and advocates for these communities. In the first and second years of medical school, students will enroll in the “Leadership in the Care of ABC Communities” course. This course will be designed to further expand students’ fund of knowledge and leadership skills in the care of patients of black, African and Caribbean island heritage. Beginning in the second half of their first year, LEAD-ABC students will engage in a longitudinal clinical clerkship at a site that serves patients from ABC communities. In the third year, LEAD-ABC medical student rotations will be centered at Long Beach hospitals and clinics. 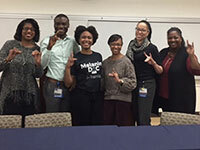 In the fourth year, LEAD-ABC students will spend at least four weeks at a healthcare site that serves patients of predominantly black, African and Caribbean heritage. Throughout their medical school education, LEAD-ABC students will be paired with appropriate mentors who have expertise caring for patients from these communities.